CJ Johnson, MPPP Volunteer of the Year! CJ is a 4th generation Californian, very proud of her family who came from the Midwest during the dustbowl days. years in the telecommunications and financial services industries as a software specialist with Charles Schwab. CJ moved to New Mexico in 2002 and by 2003, became an active member of the Taos Archeological Society. She developed a website for TAS and served as president from 2007 to 2011. During her presidency, TAS’s role in community outreach programs greatly expanded; she oversaw and coordinated efforts of several very active committees including the Education Committee. In 2008, after attending the first New Mexico SiteWatch training class offered in Taos, she agreed to be the Taos/North Central New Mexico SiteWatch Coordinator. Having an avid interest in archaeology, CJ has participated in rock art recording projects at Mesa Prieta and numerous Taos area sites. She has also volunteered at the Ghost Ranch rock shelter archaeological excavations. In 2011 CJ joined the ASNM Board of Trustees and in 2013 was elected President of ASNM. Among other responsibilities, she has assumed management of the ASNM website. In addition to all this, CJ began working with the Millicent Rogers Museum cataloging archives after creating a data base to meet the needs of the collections. She has become an indispensable member of their staff. A long-time volunteer with MPPP, in 2012 CJ offered to help with the Project website. She transferred the cumbersome site to more user-friendly software and spent considerable time tutoring the web manager in its use. She graciously continues to provide IT support for the site as requested. CJ also patiently created the MPPP Learning Center website which hosts our new 2014 edition of the 4th-7th grade curriculum, “Discovering Mesa Prieta: the Petroglyphs of Northern New Mexico and the People Who Made Them,” going to considerable trouble to have the website visually match Barbara Swenson's print and DVD versions. This is a tool for teachers and others where they can see the entire body of the curriculum and print out worksheets for teachers and students. Check our her work via the MPPP website! After 35 years of being with her partner Ann, they married in 2013. They live in El Prado with Sophie (their dog). Thank you CJ, for being the person you are and sharing the enormous skills you possess with MPPP and so many other organizations! Congratulations! Jeff Toomey - "The Wizard Award "
A volunteer with MPPP since 2005, Jeff's experience includes being a CAD (Computer Aided Design) GIS (Geographic Information Systems) instructor at Northern New Mexico College. units work in identifying locational data, the importance of documenting accurate and clearly written data, and the use of the GPS provenience grid. At the conclusion of each SYIP, Jeff opened the computer lab at Northern New Mexico College to the interns and instructed them in entry of the data collected the previous two weeks. Interns learn the concepts of data entry and actually enter the complex data including measurements, GPS coordinates, directional and descriptive data. The skills the interns learn with this process are beginner-level skills to data entry jobs in the labor market. Jeff consulted with MPPP GIS consultant Courtney Kerr as she built the MPPP multi-layer GIS database. With Jeff’s help, Courtney defined the various layers comprising the database, including layers for aerial photos, land ownership designations, roads, trails, and tracks, topography, waypoints and other data. When permission was received to work on Mr. Cook’s two parcels of land on Mesa Prieta, 4000 and 2800 acres respectively, the challenge of dividing the land into workable sized parcels arose. Working with Courtney and Lee and Candie Borduin, a land owner grid system using 20-acre pieces was developed for the MPPP data base and uploaded as a live map with waypoints on the project's GPS units. This technology provided navigational aid to recorders in the field and a link to the data base. Jeff participated with Candie in co-authoring a paper describing the challenges of the process entitled “Development of a GIS/GPS Based Method of Setting Proveniences”. Candie gave the paper to the International Federation of Rock Art Organizations at the International Rock Art Congress held in Albuquerque in May, 2013. Jeff volunteers with MPPP to manage the complex GIS database. He is upgrading the database to ARCMAP 10, upgrading the DNR Garmin software and organizing the complex software on the computer. Jeff will be spearheading the process of – at long last – getting MPPP data entered into the database via an Access format which mirrors our recording sheets. Once the data are entered, they are made available to qualified researchers, archaeologists and interns. We hope that researchers will elicit information about the 10,000 years of human activity on Mesa Prieta, and that new knowledge about the mesa and the relationships between petroglyphs and other Cultural Landscape features (such as trails, water management features, structures, lithic and ceramic scatters, etc.) will evolve. The Project has recently acquired a new computer to house the GIS database and MPPP images and scanned data. A new 27-inch wide monitor will allow MPPP personnel to use the database side-by-side with other open files, making the work much easier and enjoyable. Five-year team mates Jan Stone, Bill Cella and K. Paul Jones are the MPPP Team of the Year. The trio joined and trained together; they have recorded eight proveniences (160 acres), 570 loci and 1875 petroglyphs! Thanks to each of you for your many hours and miles in the field working for the Project. Above - K. Paul Jones, Jan Stone, Bill Cella and MPPP Project Coordinator Janet MacKenzie. Our hostess at this year's Volunteer Appreciation Picnic, Paula Breaux, was recognized with a Special Service Award. Paula has volunteered with Mesa Prieta for six years and served as Chair of the Tour Committee for most of these years, including leading Terrain Management work days on the Wells Petroglyph Preserve. She has been the lead organizer for the Annual Flute Player Tours for five years and serves on the MPPP Board of Directors. Pauly is a volunteer who pitches in with good ideas and helpful hands whenever she can. Thank you Pauly! Carl Calvert joined Mesa Prieta this year as a Docent on the Wells Petroglyph Preserve. Highly interested and highly motivated, Carl readily volunteered to lead many of the almost seventy tours given a year on the Preserve. He participated in the Terrain Management work days on the Preserve this spring, bringing tools, energy and enthusiasm to the annual task of stabilizing trails and terrain in the tour areas. Carl put in extra effort to learn the details of each of the six tours and has made valuable suggestions about the tours. Thank you Carl! Thank you to the above recognized volunteers and Thank You to all of the volunteers who work to support the Mesa Prieta Petroglyph Project. Without you, there would be no Project! Congratulations to Candie Borduin, Petroglyph Recording Coordinator, and Mesa Prieta Petroglyph Project for receiving a Heritage Preservation Award from the New Mexico Historic Preservation Division Cultural Properties Review Committee. Organization for their ongoing work in preservation of petroglyphs on Mesa Prieta and education of Hispanic and Native American youth in this uniquely rich cultural resource of Northern New Mexico. Candie is recognized "For exceptional leadership and training of 13 teams of volunteers to record 40,000 petroglyphs at Mesa Prieta." Shown left to right: Candie Borduin, Petroglyph Recording Coordinator; Jon Hunner, Interim Director of the New Mexico History Museum; Katherine Wells, President of Mesa Prieta Petroglyph Project; and Janet MacKenzie, Mesa Prieta Project Coordinator. MPPP Board member Dr. John Guth and the Archaeological Society of New Mexico Rock Art Council were recognized with an Individual Heritage Award. Dr. Guth is credited with developing a standard for submitting archival-ready petroglyph recording reports to the Archaeological Records Management System in Santa Fe. 100-meter tapes, compasses and azimuth charts for locational data. No GPS units were available for personal use. Photographs were all black and white. Dr. Crotty presented the first Petroglyph Recorder Training to Mesa Prieta volunteers in 2002; several of these original trainees are still with the project. Congratulations! Helen Crotty with Jon Hunner, Interim Director of the NM History Museum. 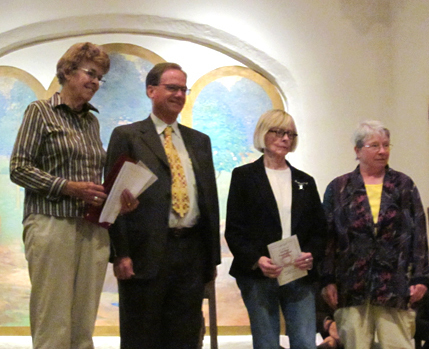 The 42nd Annual Heritage Preservation Awards ceremony was held Friday, May 16 at the St. Francis Auditorium in the Fine Arts Museum on the Plaza in Santa Fe. That three individuals and two organizations involved in the recording and archiving of petroglyphs received these prestigious awards is phenomenal! 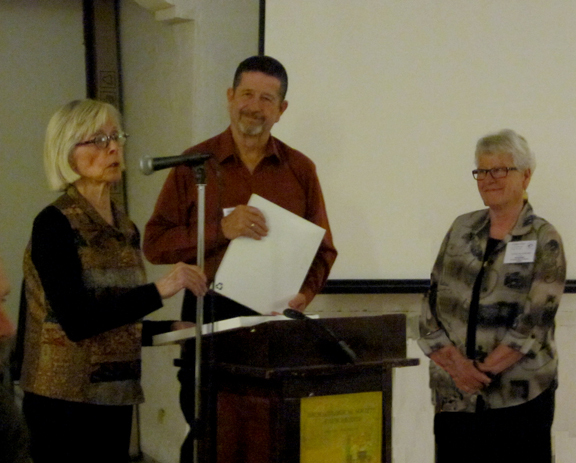 Congratulations to Katherine Wells for being named the Richard A. Bice Award recipient at the April, 2014 Archaeological Society of New Mexico Convention held in Silver City. 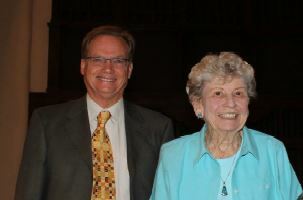 Katherine is recognized for Archaeological Achievement in her many years of preservation work for the Wells Petroglyph Preserve and Mesa Prieta. In 1999, Katherine formed the Mesa Prieta Petroglyph Project to help inform the public of the Mesa Prieta site’s importance. Katherine’s view that preservation will only happen through education has become the widely recognized hallmark of the project's very successful work over the years.